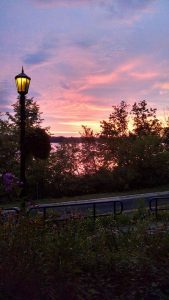 One of our favorite parts about staying at the Summit Inn Bed and Breakfast is that the sunset can be watched from our gazebo out front. As if that isn’t amazing enough, it is also overlooking North Center Lake. 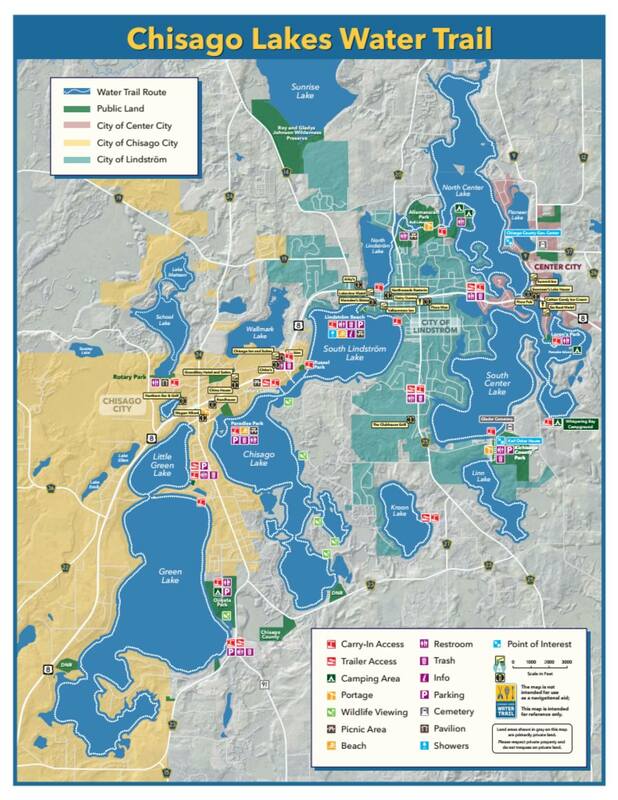 Interestingly our community has 19 major lakes, yup I said 19 MAJOR lakes! Recently there has been a map of the watershed in our community along with portages and trails to get from one to another. The Water Trail now has it’s own website with great information on both the water trails and where to a boat, kayak or canoe for a day of fun on the water. The best place to rent a boat is from our local boat dealer Frankie’s Live Bait and Marine, 10680 South Ave, Chisago City, MN 55013. They have options from fishing boats to pontoons. You probably won’t do much portaging but you can still spend the day on the lake! 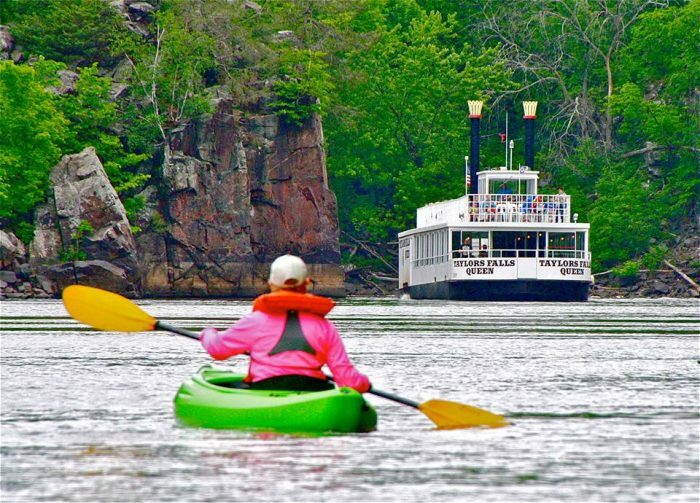 Captain Shawn’s Charters and Rentals located at 12565 Lake Blvd, Lindstrom, MN 55045 would be the closest place for Summit Inn Bed and Breakfast guests to get a kayak or canoe if you wanted to explore our Water Trails system. Of course you can always bring your own kayak or canoe and skip the extra trip to a rental place. 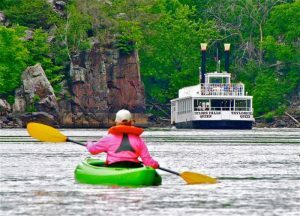 Another water option is to spend some time on the mighty St. Croix River which is less than 20 minutes from Summit Inn Bed and Breakfast. There are many opportunities for you to rent a water-worthy vehicle of some sort and many have pick-up and drop off buses as well. A lovely amenity when you have paddled yourself miles downstream, your arms are tired and the idea of having to paddle back up stream is too much to fathom. Taylor’s Falls Canoe and Kayaking, 307 Milltown Rd, Taylors Falls, MN 55084, and Eric’s Canoe Rental 1289 S Vincent St, St Croix Falls, WI 54024 are a couple in Taylor’s Falls and St, Croix Falls however Osceola is just down Wisconsin Hwy 35 and they also have kayak and canoe rentals on the St. Croix River. Keep in mind that most of the smaller places will have an opportunity to participate in a guided tour, hire your own guide or charter your way. Perfect for those of us who have directional disability disorder or are unable to channel our inner pirate. Ha! 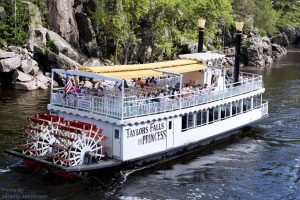 Perhaps you aren’t totally comfortable with water but still want to enjoy the river valley bluffs and scenery, a great option for you would be the Taylor’s Falls Scenic Boat Tour. Jump back in time a take a leisurely trip down the river on an actual paddleboat. The captain will give you a lot of historical information on what you will be seeing and you can ride on top in the sun or on deck level in the shade. 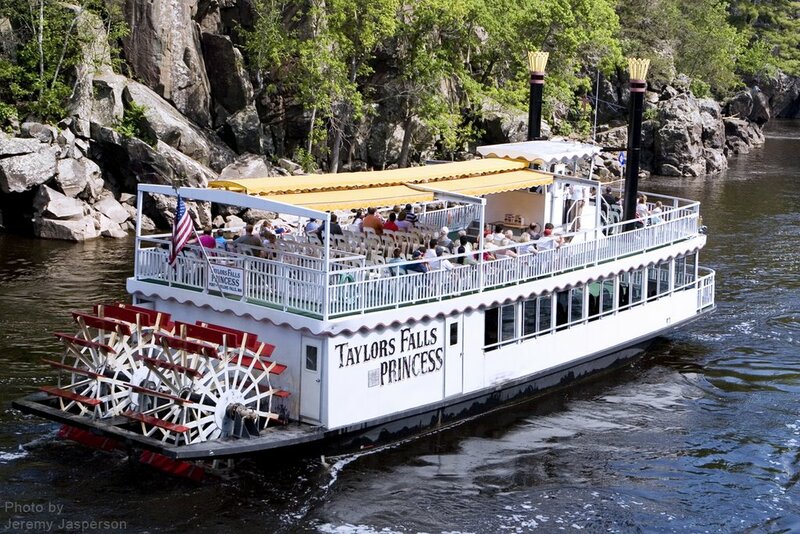 They also have dinner cruises that run if you’d like to spend your night wining and dining on the majestic river. If you decide the “Princess” or “Queen” is for you, show up early and hike through Interstate Park and see some of our geological amazements. Here is a link to a fellow blogger HutchK12 that explains that further. He also has fabulous pictures that will give you just a taste of what you will experience. Finally if you’re looking to not work so hard at it but want to get on the water, there is always floating down the river in an inner-tube. 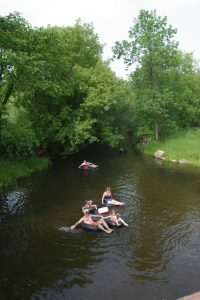 A little further away but there are opportunities to travel down the Apple River in Somerset, Wisconsin or the Sunrise River in Sunrise Township, MN. The Apple River is well-known and hosts several Woodstock-like concerts where people show up, camp and party. Weekends are crazy busy but during the week, the river is quiet and the people pleasant. Something to consider. In Sunrise Township the Sunrise River Pub and Grill not only has great food and ice cream but also will rent you a canoe or inner tube. 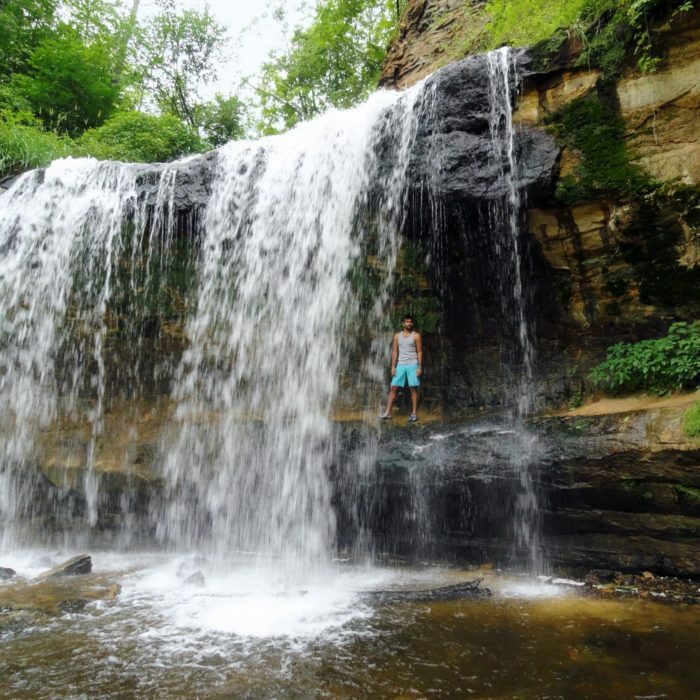 No one but the locals really know about this place so if you want to experience life in the Chisago Lakes Community and avoid crowds, this is where you definitely want to go! 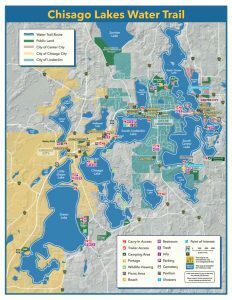 We hope this helps make decisions on how to enjoy all the water we have near us. As you can see, there is no shortage of opportunities. Maybe add a day or two onto your trip with us and do it all, the sky is the limit! As always, talk to any of the Innkeepers at Summit Inn Bed and Breakfast if you want more information, help with directions or reservations. See ya then!